Italian actress Sophia Loren, godmother of the MSC fleet, inspired the décor aboard the MSC Diva Divina. The color scheme throughout most of the ship is burgundy and silver, often with sparkles. In the high class private area called the MSC Yacht Club, accessible for yacht club suite guests only and defined by MSC as a ship within a ship, silver accents give way to gold, particularly on the spectacular Swarovski crystal stairway – though personally I prefer the atrium’s crystal stairway in silver to the yacht club’s gold. The silver color sets of the sparkle of the crystal more stunningly in my opinion. The largest and most expensive suite on the ship, named the Sophia Loren suite, was designed by the actress herself. It has separate living and bedroom areas with burgundy colored furniture and black & white photos of her hanging on the walls. Glitzy without being gaudy, the ship decor makes use of lots of mirrors, lights, sparkles, and silver color to bring about its glamorous appearance and a hint of luxury in the public areas. Some public areas sport red carpets so passengers can experience a walk-down-the-red-carpet star feeling. The atrium towers several decks high. Two flights of swarovski crystal stairs sparkle and shine their way up the two lowest decks of the atrium. Each stair cost $3000 euros and the ship has 100 of them total including the gold ones in the MSC Yacht Club area. All around the ship passengers can find lots of little nooks where people can sit and relax or gather together with friends. The ship did seem to have quite a number of odd statues. At least I found them odd. Misshapen representations of women with skinny upper halves and extremely large legs and derrieres in a variety of poses or doing various activities. It also had a few painted masks, but other than these strange items the rest of the ship looked quite lovely. Many old black and white photos placed about the ship show a variety of famous people, most of them visiting Italy around the 1950’s and 60’s – the heyday of Sophia Loren’s movie era, though she has appeared in more recent films such as Grumpier Old Men. The ship had some multi-use spaces like the Piazza Del Dodge, decorated with a clouds and stars ceiling and old world café look with numerous cute little tables. This area had gelato and sweets for sale. It sometimes had watch or jewelry sales, demonstrations, or activities and was also used as a muster station. Some hallways, like those leading to the Piazza del Dodge, had painted murals. Each bar, lounge, or restaurant area in the ship had its own unique décor, different from every other bar or restaurant or the other areas of the ship. The crew diligently kept everything clean and shiny. For general information about the Divina including dining room dress codes click here. For information about Cabins on the Divina click here. Read about a special balcony cabin here. 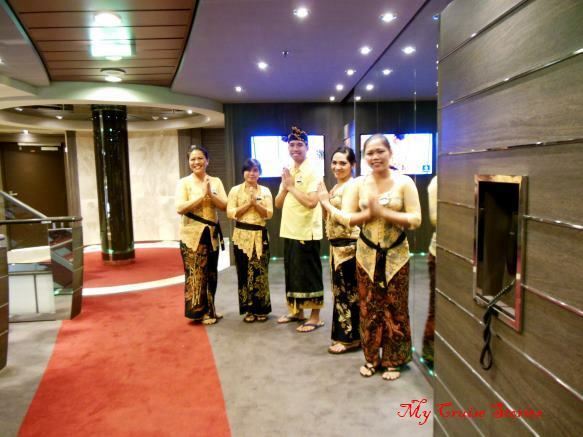 This entry was posted in Divina, MSC, Shipboard Life and tagged bling, cruise ship decor, Divina, MSC, photos. Bookmark the permalink. Being of Italian descent, Sophia Loren was a big deal in my family when I was growing up. I always thought that she had a stunning face and even at 80, she still looks pretty good. If that cruise ship had been around when my parents were still kicking, they would have been in their bliss on it. It really would be the ultimate cruise ship for a Sophia Loren fan. Never knew about this line … thanks! .. What’s the biggest difference between them and lines like Royal Caribbean? MSC is based in Italy so most of their ships cruise Europe. The Divina has had the crew, menu, and some of their policies Americanized, but the European based ships have different food with smaller portions and the crew doesn’t interact with passengers much because apparently the Europeans would rather they did the work behind the scenes and were never seen. Much like a house elf in Harry Potter where someone in one of the books said the mark of a good house elf is that you don’t know it’s there. Americans usually want to know who their cabin steward is. We went on the Divina shortly after it came to America so the crew was learning to interact with passengers then. MSC also has cargo ships. We saw one in the Panama Canal while on an excursion from the MSC Divina. MSC stands for Mediterranean Shipping Company. As far as I know none of the American cruise lines have container ships as well as cruise ships. The Divina had activities scheduled all day long and had separate cruise directors for English and non-English speaking passengers. The daily newsletters came in a variety of languages, with the appropriate version delivered to each cabin and listing activities for people who spoke that language. As far as I know most American ships just have one cruise director and mainly activities done in English, though I have seen some in Spanish on other vessels. The cruise director said in Europe they don’t schedule activities during the day because the people mainly sit out by the pool. There did indeed seem to be flocks of deeply tanned Europeans in the poolside deck chairs every day. They also only offered the early and late dining times and not the option to go to dinner anytime within a specific time period like most American cruise lines do. Much to my great disappointment, although they had an entire shop dedicated to a variety of types of models of the ship they did not have any ship model Christmas tree ornaments so my fleet of tiny ships on the Christmas tree is missing the Divina. I do have a lonely Divina magnet on the refrigerator though. Bummer on the ornament … but thanks for all the scoop! My wife would love the stairs. We don’t have any Swarovsoki but she would like to have some.